ABC Russian: Russian Verbs of Motion. Part 2. Russian Verbs of Motion. Part 2. This the continuation of the topic "Russian verbs of motion", the first part you can read here. Step by step we will learn this challenging grammar topic. Learning about the verbs of motion can be one of the hardest concepts in the Russian language. It is not so difficult if you take them one step at a time. As you already know, Russian verbs of motion always come in pairs: there are two verbs for each type of motion, a multidirectional and a unidirectional form. And remember that all unprefixed verbs of motion are imperfective. Verbs of motion go in pairs and have their rules and irregularities. Once you've familiarized yourself with the first pair of verbs, you'll have an idea how to use the rest of the verbs of motion. All the names of these groups you’ll find in any Russian grammar or textbook. Let’s start from the first group. 1) movement in one direction or to a named destination. Where are you going now? I am going to the job. Maria is going to the university. A main function of multidirectional verbs of motion is to describe repeated return journeys and habitual actions. Каждый день я хожу на работу. Everyday I go to the job. Два раза в неделю Ваня ходит в спортзал. Vanya goes to the gym twice per week. каждый + вторник, сентрябрь, выходные etc.- every Tuesday, every September, every weekend etc. 2) Round trip journey (in the past tense) Can be replaced by the verb "was"
В пятницу мы ходили в театр = В пятницу мы были в театре. On Friday we went to the theatre = We were in the theatre. В апреле мы ездили в Суздаль = В апреле мы были в Суздале. 3) Movement without any particular destination or in a number of different destinations. Мы долго ходили по городу. We walked around the city for a long time. 4) The ability to do something. 5) with verbs любить ( to love) and нравится ( to like) Actually when you use verbs like любить and нравится you describe your habitual actions. Мне нравится бегать в парке. = I like running in the park. 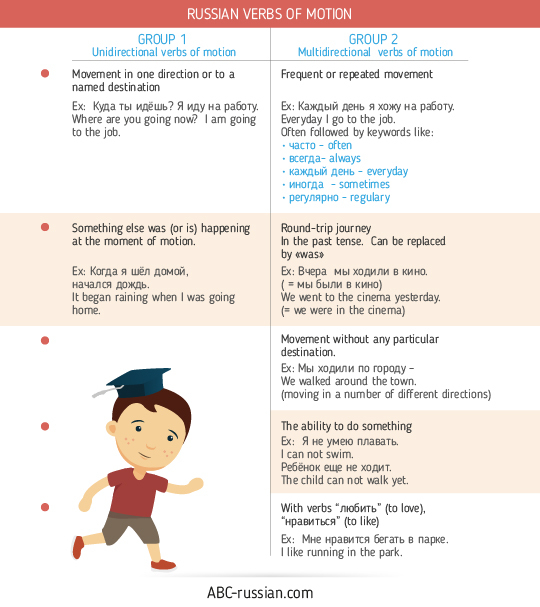 These are the main meanings of Russian verbs of motion of moth groups. The idea is - to understand how the systems works. You can have a look into this table and all the verbs from the left column will have all these meanings for group 1 and as a consequence all the verbs from the right column will have all the meanings described here for the second group. If you are comfortable with the concept learnt in these parts, you can easily apply this same concept to the other verbs of motion. Feel free to ask questions in the comment box!